Education Physical Therapy Orthopaedic Residency Program in 2011, Sacred Heart University Doctor of Physical Therapy in 2009, Sacred Heart University Bachelor of Science in Nutritional Sciences in 2006, University of Connecticut Certifications IAMT Certified Dry Needling Therapist Board Certified Orthpaedic Specialist Graston Technique® Clinical Specialties Manual therapy, post-surgical rehabilitation, chronic pain, and sports-related injuries. Organization Memberships American Physical Therapy Association Connecticut Physical Therapy Association Programming Committee Director, CTAPTA Orthopaedic Manual Therapy Special Interest Group American Academy of Orthopaedic Manual Physcial Therapy (AAOMPT) Honors & Awards 2017 American Physical Therapy Association Emerging Leader Outside of the clinic… Joe enjoys spending time with his growing family, recently welcoming their daughter Madalyn in 2017. He loves going on New England day trips on weekends and exploring new things within his community. In addition, Joe is a lifelong learner and loves working with students both in the classroom and clinic. He frequently attends conferences, courses, and stays up-to-date with current Physical Therapy literature to provide best care to all his patients; it truly is a labor of love! 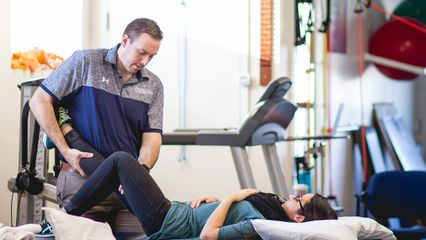 Education Doctor of Physical Therapy in 2014, University of Connecticut Bachelor of Arts in Political Science in 2006, University of Vermont Certifications Board Certified Orthopaedic Clinical Specialist (OCS) Certified Orthopaedic Manual Therapist (COMT) Clinical Interests Orthopaedic and Spine Sports Medicine and Rehab Post-Concussion Management Headache Management Affiliations American Physical Therapy Association (APTA) CT Physical Therapy Association (CTPTA), Legislative Committee Maitland-Australian Physiotherapy Seminars Outside of the clinic… Tom enjoys combining new experiences with his love of the outdoors. He has hiked inside a glacier, backpacked through the desert and stood on the peak of Cloud’s Rest in Yosemite. Tom’s passion for adventure translates directly to his work as a physical therapist, as he strives to get all of his patients back to the things they love.